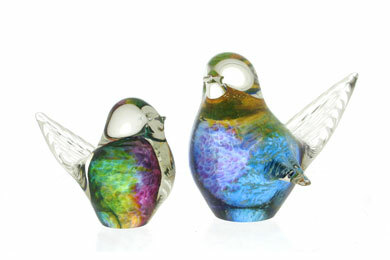 These unique and handmade glass birds to me represent love birds (the marriage couple) and the rainbow colours represent their exciting lives ahead. I have a stand as a base with the couples’ names and wedding date reverse-engraved. The birds look beautiful sitting on the clear crystal glass pedestal. It’s a great wedding gift, on top of the traditional money envelop which is rather meaningless. It was a pleasure corresponding with you and I look forward to enjoy your excellent service again in the near future.